When you think of a frozen ice treat, what flavor comes to mind? The all-time classic favorite sno cone flavor is cherry shaved ice syrup. If you are looking for the perfect cherry snow cone flavoring syrup, look no further. Just when you thought this classic, delicious flavor could not possibly get any better, it has. This crowd favorite is our best seller, and for good reason. Hawaiian Shaved Ice has perfected the cherry shaved ice syrup and our customers seem to agree. Don�t believe us? Try it for yourself! 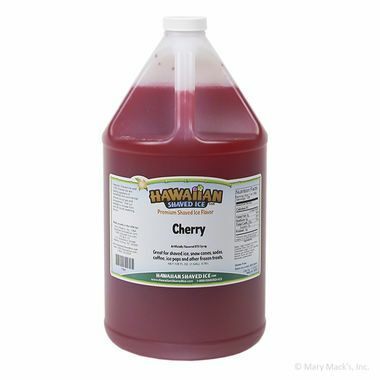 Pour this delicious cherry flavored syrup on your next snow cone or shaved ice and you will see what all the raving is about. Since we know you�re not going to be able to have just one, we made this number-one best seller in the gallon size. We also have this snow cone syrup available in the quart and assorted flavor packs.